After one year from ratification of this article, the manufacture, sale or transportation of intoxicating liquors within, the importation thereof into, or the exportation thereof from the United States and all territory subject to the jurisdiction thereof for beverage purposes is hereby prohibited. The 18th Amendment was ratified by 46 of the 48, states and went into effect on January 16, 1920, so now America was dry. Bro. Moe W. Smith was raised a Master Mason in Emanuel Lodge No. 654 on November 8, 1922. His friend, Bro. Isadore "Izzy" Einstein, was affiliated with Emanuel Lodge on December 13, 1922. Moe Smith played the Dr. Watson to Izzy Einsteins Sherlock Holmes, and they were probably the only two prohibition agents whom the public liked. They operated in the first years of Prohibition, 1920 to 1925,3 when it was comparatively hard to get a drink; the years when bartenders peered out through peepholes and new customers had to go through the formalities of presenting admission cards or saying "Joe sent me." Moe, although somewhat in the role of straight man, was a highly effective agent, but Izzy (the human chameleon), with his numberless disguises, was the color and front man. He was, in turn, a traveling salesman, a street cleaner, a banker, a bartender, a grave digger, a streetcar conductor, a Texas cattleman and, in Hollywood, a movie extra. You name it, he played the part. The pair closed innumerable speakeasies in every imaginable way. A speakeasy around Van Cortland Park was padlocked after Izzy arrived in a mud-covered football uniform and announced that the gridiron season was over and he was ready to break training. In Coney Island, he entered a drinking joint in a wet bathing suit, shivering and gasping for aid. Wearing an attendants white jacket, he shut another saloon near a hospital. Izzy once tossed his agents badge on the bar of a Bowery saloon and  this fat, unkempt individual  asked for a pint of whisky for "a deserving prohibition agent." The bartender sold it to him, thinking him a great wit. 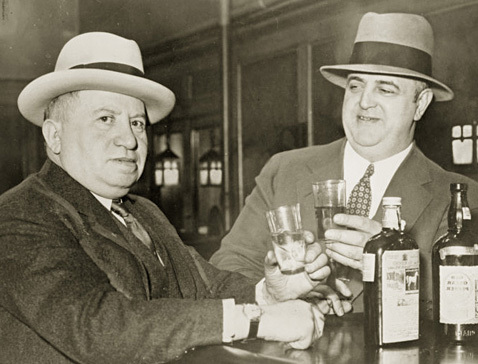 Izzy and Moe, rotund and cheerful men, made life so miserable for the prohibition-law violaters, that waiters, bartenders and speakeasy proprietors feared to sell liquor to anyone if a "rumor" circulated that "they" were in the area. In its 125 year history, Emanuel Lodge No. 654 probably has never had two such colorful members as Isadore Einstein and Moe Smith  the famous "Izzy and Moe."5. 1. Library of Congress. New York World-Telegram & Sun Collection. hdl.loc.gov. World Telegram staff photographer, 1935. 2. 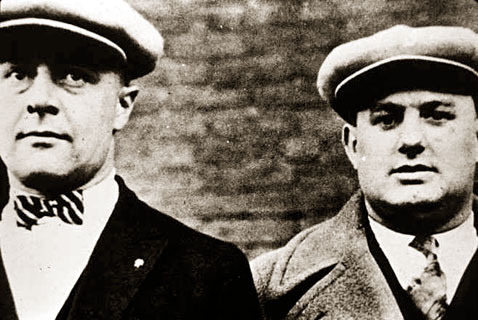 "MOE SMITH AND IZZY EINSTEINWho lost their jobs as prohibition agents last week and who, we can't help thinking, ought to make the best pair of bootleggers in these parts, knowing what they do about the sources of supply. They are here pictured in the disguises in which they evaded detection in the night clubs of New York." New Yorker Magazine November 1925. 3. On 13 November 1925, they were fired "for the good of the service." "The service must be dignified," an official said in explaining the firing. "Izzy and Moe belong on the vaudeville stage." [Cited by by Joan Rapczynski, Florence Zywocinski in Prohibition As A Reform. 4. Einstein reported that in most cities it took only thirty minutes to find alcohol. In Pittsburgh, he says it took eleven minutes; in New Orleans, thirty-five seconds. 5. Also see : Isadore Einstein, Prohibition Agent No. 1, With an introduction by Stanley Walker, with fifteen reproductions in black-and-white from photographs. New York, Frederick A. Stokes Co., 1932. xxii p., 1 l., 261 p. front., plates, ports. 20 cm. LCCN: HV5089 .E4; ; Fredrick Lewis Allen, The Big Change, America Transforms itself 1900-1950. New York: Harper & Brothers Publishers, 1952. p. 17 ; Fredrick Lewis Allen, Only Yesterday and Since Yesterday, a Popular History of the 20s and 30s. New York: Harper and Row publishers, Inc. 1986. pp. 243-265; Thomas M. Coffey, The long thirst : prohibition in America, 1920-1933. New York : Norton,  xii, 346 p. ; 21 cm. ISBN: 0393055574. Bibliography: p. -331.